The Martin 000-28EC - The Martin Eric Clapton Signature Series Acoustic Guitar. The Martin Eric Clapton Guitar. Virtually everyone everywhere in the English speaking world knows exactly who Eric Clapton is. This is exactly as it should be, in my opinion, for the man is a music legend the likes of which only comes around once. I've been very pleased to have seen Eric Clapton twice in my lifetime live, and both shows were outstanding, and very memorable. I'll never forget either one of them, and enjoyed the second one even though I was seated at the rear of the stage, and watched it looking at Clapton and Crew's backsides at Reunion Arena in Dallas. Reunion has since been imploded, and now, should you wish to catch a great concert in the Dallas area - You'll be seeing someone like Eric Clapton play at the American Airlines Centre. A Martin 000 28EC and Some Blues! Eric Clapton Surely Approves Of This Video!! 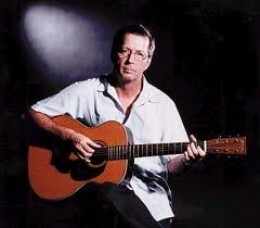 Eric Clapton And His 000 28EC!! So what is a Martin 000 28EC? Well any time that you see a "28" in regards to a Martin guitar model number, you know that you are looking at, or reading about a guitar with "28" appointments, and that means that the guitar in question is of solid rosewood back and sides, solid spruce top, or "sound board," mahogany neck, ebony fingerboard, and abalone inlay fret markers. The "000" refers to the size of the body of the instrument, and it also means that it is a smaller guitar than a "D" model, or "Dreadnought" and larger than a "00" model. Basically, the 000 28EC is a guitar that is closer in size to a traditional "Spanish Guitar," but has a thinner body, wider fretboard, and is made to Martin's famous "28" appointments. Now, I didn't realize this before looking over the Wikipedia article about C.F. Martin & Company, but it says in that article that there are actually FIVE Eric Clapton model Martin Guitars. I'm going to have to research that a little bit to find out what the other three are, but the second that I do know of is the 000 28ECB. 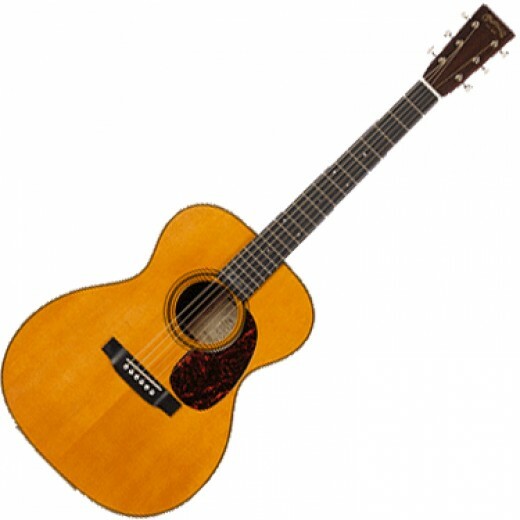 Every Martin guitar with a "28" in the model name is a guitar with all solid wood construction, and Rosewood backs and sides, and Spruce soundboard. The 000 28ECB is the same, but the "B" stands for Brazilian rosewood, which is used on that guitar instead of East Indian Rosewood. Most people find that Brazilian Rosewood, with it's strange patterns and colourful variations, is a more beautiful tonewood than is East Indian Rosewood. The fact of the matter is that Brazilian Rosewood is an endangered species of tree, and because of that, and supply and demand economics, Brazilian Rosewood is a MUCH more expensive tonewood. Also, not everyone can hear the difference between a Brazilian Rosewood guitar and an East Indian Rosewood guitar - but there IS a difference in the tonality that those two fine species of rosewoods produce in acoustic guitars. I can hear it, but I've got trained ears for it. What is slightly different in the 000 28ECB is that even though most Martin acoustic guitars that feature Brazilian Rosewood also feature either an Engleman Spruce, or Adirondack Spruce soundboard, the Martin 000 28ECB features the standard Sitka Spruce soundboard - clearly, Eric Clapton prefers Sitka Spruce soundboards to the German Engleman Silver Spruce and the Adirondack Red Spruce that are often thought of as "superior" tonewoods for soundboards by other players. I've personally owned guitars with Adirondack Spruce soundboards, and there is a very slight visual difference in that tonewood and Sitka Spruce, I've not ever been able to truly say that I can hear a difference between them. It goes without saying that both the 000 28EC and the 000 28 ECB are both OUTSTANDING acoustic guitars, but it's also pretty obvious that Eric Clapton's personal guitar is the Brazilian Rosewood model, the 000 28ECB. These guitars are also available in sunburst finish, as are all Martin acoustic guitars with a solid spruce top. Eric Clapton's signature is featured between the nineteenth and twentieth frets in mother of pear. Martin Acoustic Guitars, and the 000 28EC. Like all solid wood construction acoustic guitars by the legendary American Guitar Manufacturer, C.F. Martin & Company, both the Martin 000 28EC and the Martin 000 28ECB are exceedingly fine instruments that come with a lifetime warranty to the original owner. These are guitars that, if properly cared for, will not only last you a lifetime, but will become heirlooms for whoever in your family that you leave such a fine instrument to. These guitars aren't cheap, and they aren't inexpensive either. These are a professional's instrument - not just campfire beaters. Eric Clapton recorded his fabulous Unplugged album with one of them, and probably he's recorded a whole lot more with his as well. These guitars are described as "a fingerpicker's dream," and I'm sure that that statement is accurate enough - but there's no reason that a flatpicker couldn't spend a lifetime flatpicking the daylights out of one too. After all, champion flatpicker Steve Kaufman regularly plays some 000 sized instruments, as well as his Dreadnought sized flat top steel string acoustic guitars. I've personally had my hands on at least two Martin 000 28EC guitars, and loved the hell out of both of them. I don't talk about or write about guitars that I've NOT had my hands on. I'd recommend one of these to anyone who's in the market for a fine, lifetime instrument, and who's to say just how much one of these guitars could appreciate in value. What's certain is that if it's not dinged up, it won't depreciate in value at all. What this is is another fine instrument from C.F. Martin & Company that will be desirable and sought out for the rest of our days.